Our safe, secure gardens offer a variety of experiences for all age groups of children. The all-weather safety surfacing allows the opportunity for your child to use the garden everyday. The garden is fully enclosed providing a safe area for everyone to enjoy the fresh air and exercise. All activities offered indoors are also offered outdoors. The children enjoy daily exercise both indoors and out through music and movement, physical games and the use of outdoor equipment such as bikes, scooters, climbing frames, balls and hoops. The children also assist the nursery staff looking after the plants in the garden and everyone particularly enjoys feeding the birds and learning about insects. Your child can use a cot, rocking chair or a small bed for their sleep times. Each child has their own bed linen and are calmly settled for their sleep by the nursery staff. All children at Hoodles Childcare brush their teeth on a daily basis after snack and/or lunch. Your child will be provided with their own toothbrush and toothpaste. For the health and well being of all children attending Hoodles Childcare, your child should not come to nursery if they are suffering from an infectious illness. If your child suffers from a non-infectious illness or an allergy we will endeavour to accommodate any special requirements they may have. Parental permission is required for all medication to be administered at Hoodles Childcare. 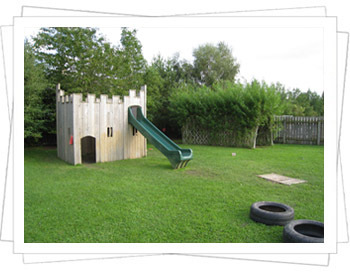 Our safe, secure gardens offer a variety of experiences for all age groups of children. The all-weather safety surfacing allows the opportunity for your child to use the garden everyday.